When you constantly nag "It is so hot everywhere!" You feel like talking bath everytime you sweat. When you invariably start drinking more cold drinks. Every second advertisement aired on television is that of soft drink or an air conditioner. You see lot of meaningless cometitions in soft drink ads. Nothing satisfies like a glass of "Roof Afza" Sharbet. When you see sugar cane juice stall "Ganne ka ras" and instantly stop by. You finish one and order for second with extra masala. When lemon juice is sheer delight to consume. Eveyday dinner at home has added dish of "Aam ras" or "aam panaa". Ice creams are always a welcome. You get engrossed in Ice golas!You plan to buy bright coloured clothes. You find yourself applying tons of sunscreen lotion before stepping out. When you find children playing cricket even in scroching heat and mothers are always after them asking them to get back. 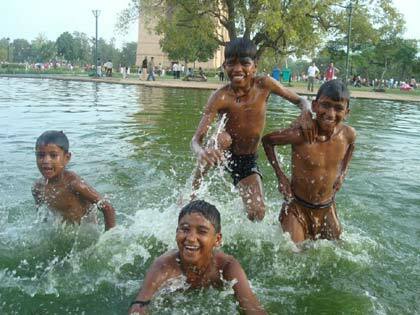 Find kids relaxed after the exam pressure is over and excited about their summer vacation outtings. They are always excited about going to Nani's or Mama's place and meeting their other cousins. fOoD fOr ThOuGhT: Rather than food for thought it should be drink for thought! Hey do you guys miss the golas sometimes, or the kulfis, kids programmes on Doordarshan channel..."Chuti Chuti", "Dekh bhai dekh", "Super Samurai". Do you feel like going back and getting engrossed in those comic books again? So, there is a newer way of saying what season it is!!! Thanks to the world of ads :) good post... It is too much of nostalgic when we talk about the summers.... i want those 2 months of holidays back in life!!! @Mohan: You are so correct... ya miss those 2 months vacation. Thanks for your comment :) Glad you liked the poem. How have you been? @Rohini: Yeah I know banta, I too like it... Thnx a lot for your comments! @♫♪♥W!nK♥♪♫: Doing good, Wassup these days with ya? your new poem is yet again cool!